Yiddish writer Avrom Sutzkever (1913–2010) was described by the New York Times as “the greatest poet of the Holocaust.” Born in present-day Belarus, Sutzkever spent his childhood as a war refugee in Siberia, returned to Poland to participate in the interwar flourishing of Yiddish culture, was confined to the Vilna ghetto during the Nazi occupation, escaped to join the Jewish partisans, and settled in the new state of Israel after the war. Personal and political, mystical and national, his body of work, including more than two dozen volumes of poetry, several of stories, and a memoir, demonstrated the ways in which Yiddish creativity simultaneously balanced the imperatives of mourning and revival after the Holocaust. 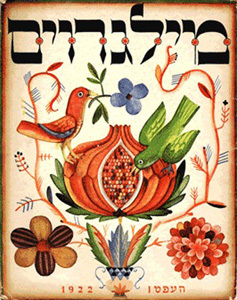 In The Full Pomegranate, Richard J. Fein selects and translates some of Sutzkever’s best poems covering the full breadth of his career. Fein’s translations appear alongside the original Yiddish, while an introduction by Justin Cammy situates Sutzkever in both historical and literary context. Selected and translated by Richard J. Fein ; introduction by Justin Cammy ; preparation of the Yiddish text by Harry Bochner and David Braun. Cammy, Justin, "The Full Pomegranate: Poems of Avrom Sutzkever" (2019). Jewish Studies: Faculty Books, Smith College, Northampton, MA.